I must admit that stuffed vegetables rarely inspire me. Ella makes a fine, chilli-enlivened stuffed pepper (with tomatoes and mozzarella), but too often stuffed veg means simply a bit of veg with some other veg piled on top. In my book that’s not good enough. However, for some reason, I fancied stuffing some veg the other day. I wanted a tomatoey dish, sweet and tangy, but for other flavours and textures to be involved too. Something hearty and warming perhaps. 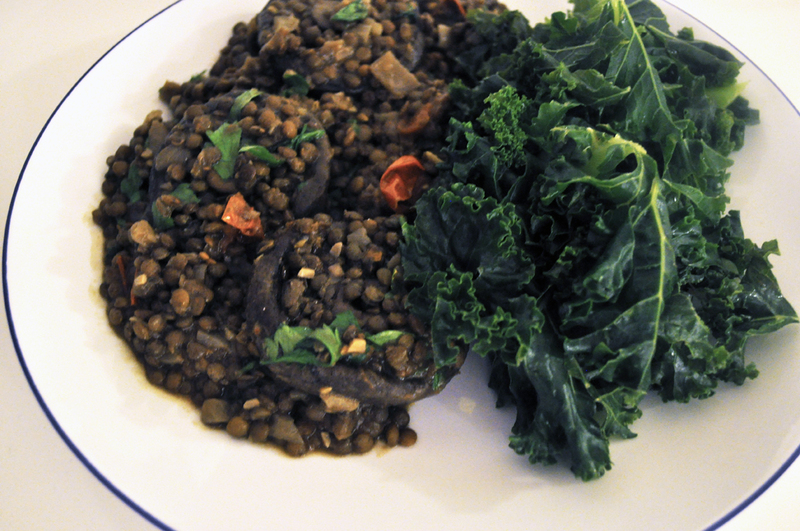 Some Puy lentils seemed like a good idea, cooked until tender, with a little olive oil and red wine vinegar, and added to the halved and hollowed out tomatoes. These were then baked in the oven on a low temperature – around 120C – so that the tomatoes almost dry out and intensify in flavour rather than cooking to a mush. Timings are approximate here: 1 hour? 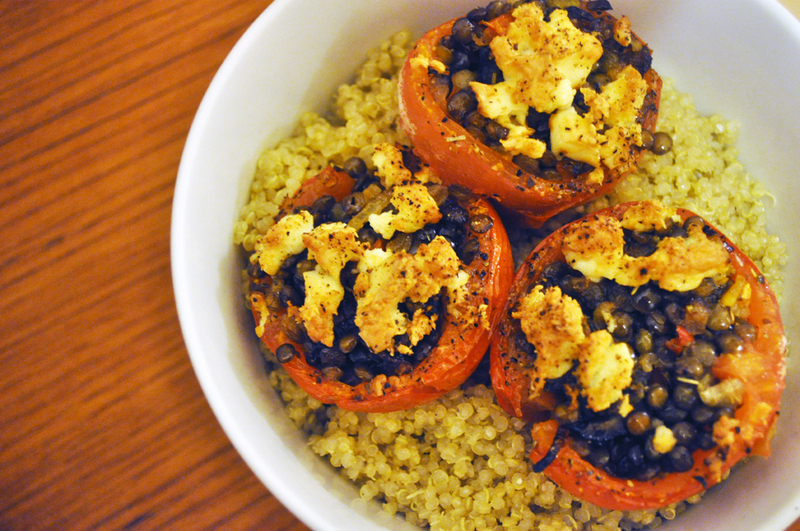 At the end of the process we added some crumbled feta cheese on top and served on a bed of quinoa. And very tasty it was too. We’ve been mentioning chef Denis Cotter rather a lot recently, partly because we’re working our way through some of his recipes in his latest book. In it, at one point, he eulogises the aubergine and sets a challenge: take an aubergine or two, find some other ingredients lying around the fridge and store cupboard, and make a meal of them. That’s right, like an aubergine-based Ready Steady Cook from TV. This was our first attempt. We had two aubergines, some cherry tomatoes, pine nuts, some herbs, lentils, a little yoghurt, a few other ingredients too… so, what to do? 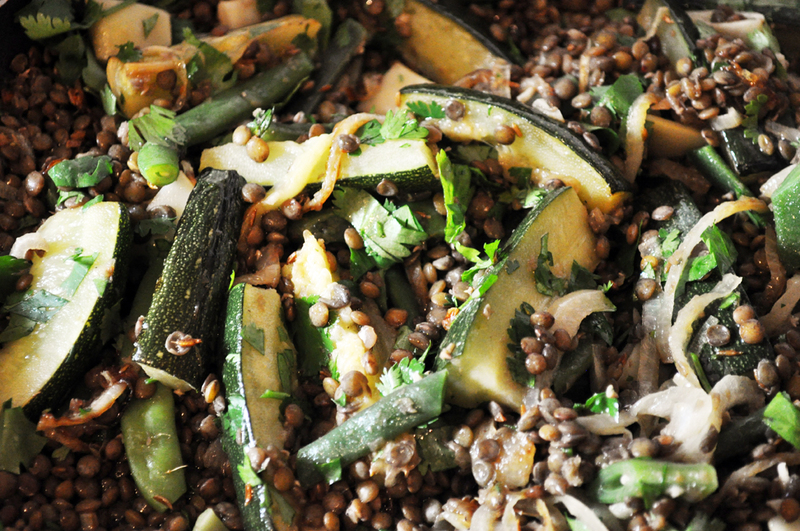 To make a hearty supper we decided to base the meal around Puy lentils, with a contrasting topping. First get the lentils going, enough for each person in some vegetable stock. Simmer until tender but still slightly nutty (around 30 minutes? ), drain and then add 2tbsp of red wine vinegar, stir through and set aside. While the lentils are cooking, top and tail the aubergine (you’ll need one per person) and slice it from top to bottom to get four lengths of equal thickness. Place them in a single layer on a baking sheet and drizzle with olive oil and roast for around 20 minutes until golden and softened. Alternatively, brush them with olive oil and griddle them for a nice charred effect. Next, half a couple of handfulls of cherry tomatoes. Half them again lengthways to make little segments. Then scrape out the seeds and excess juice. Place in a bowl and add a pinch of salt and pepper and a chopped red chilli (to your taste). Stir in and set aside. Then toast a couple of tablespoons of pine nuts in a dry frying pan for a couple of minutes until slightly browned – take care not to burn them. Finally, in a small bowl, take 150ml of Greek yoghurt and add a little olive oil, the juice of a lemon, a clove of crushed garlic and a pinch of salt and pepper. Stir. If it isn’t the consistency of double cream, add a little milk or a little extra olive oil, or both. 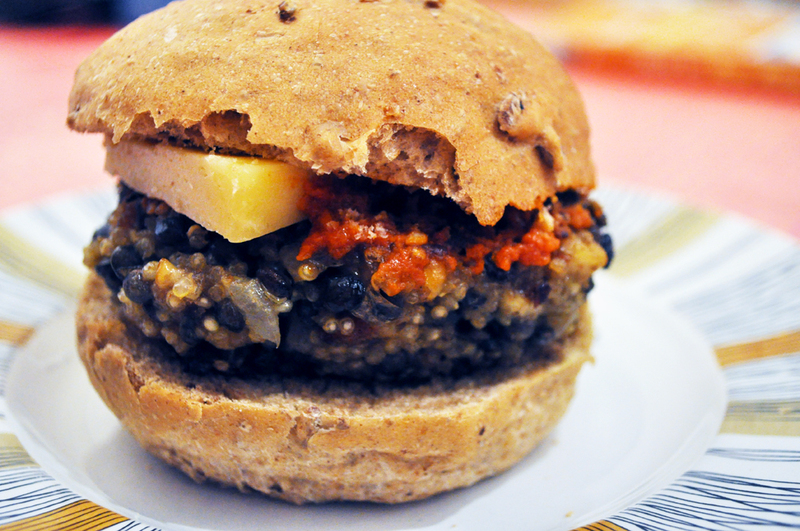 When the aubergine is cooked and cooled slightly they can be stuffed. Add the pine nuts to the tomatoes and mix through. Now take a dessert spoonful of the mixture and place it on one end of an aubergine slice and roll up. Do the same for the rest. Place the lentil rolls into a medium oven to warm through. Chop some fresh parsley, or a little coriander or mint, and stir it into the lentils and place back on a low heat. 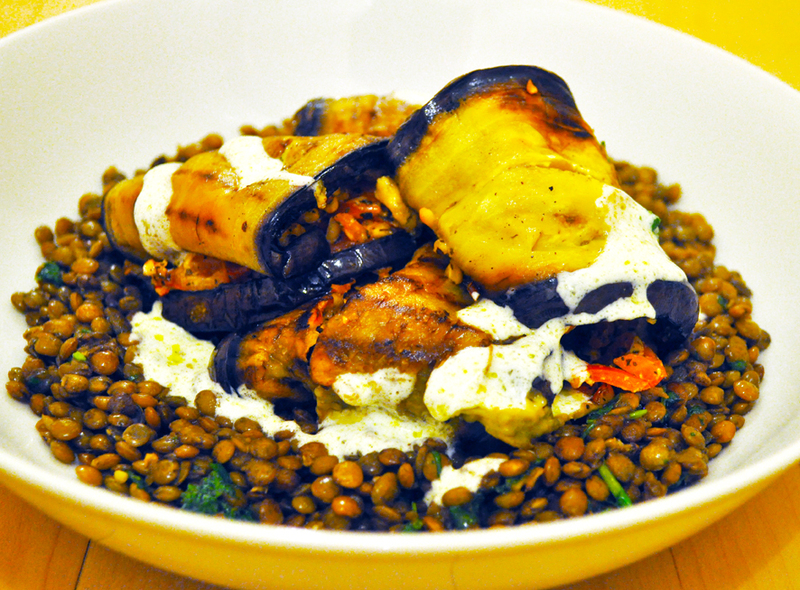 When the lentils and aubergine are warmed, plate up: lentils on the bottom, aubergine rolls on top and a drizzle of yoghurt sauce all over. 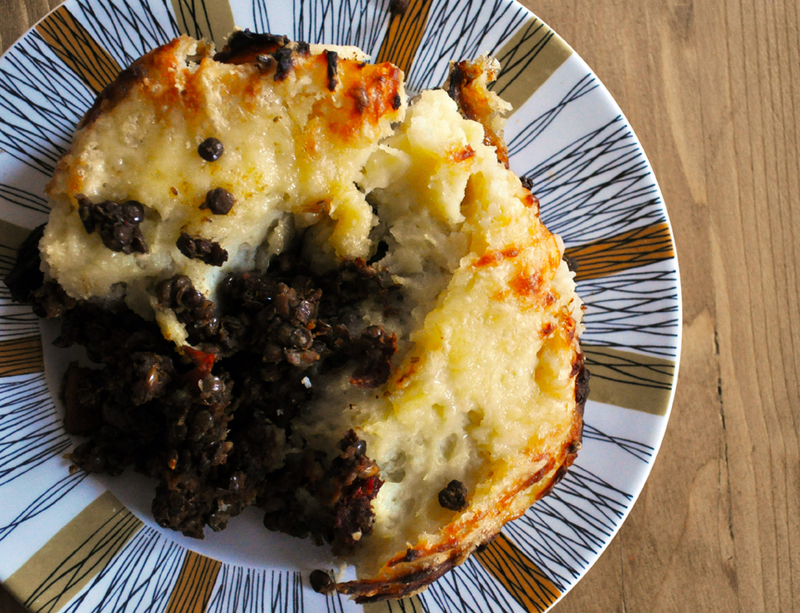 Smashing, smoky, tangy and wholesome, warming fresh and good. With a tiny chilli kick. 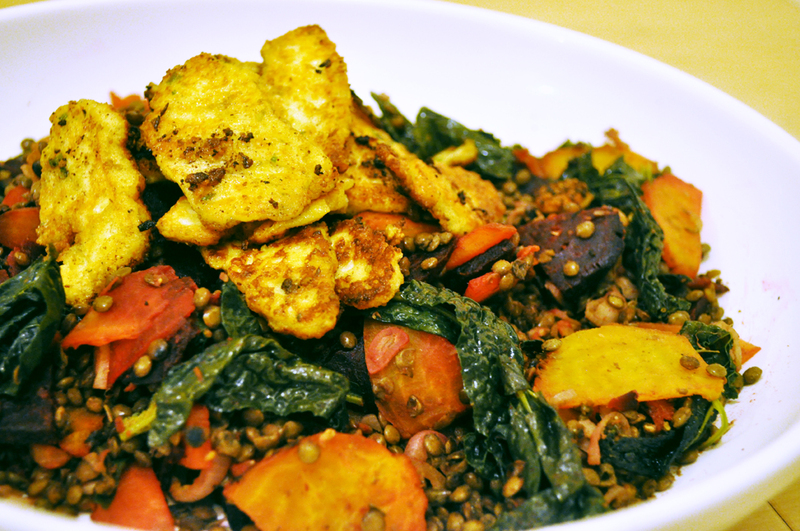 Here at ETP Towers we have a standard lentil dish that we serve with feta cheese. 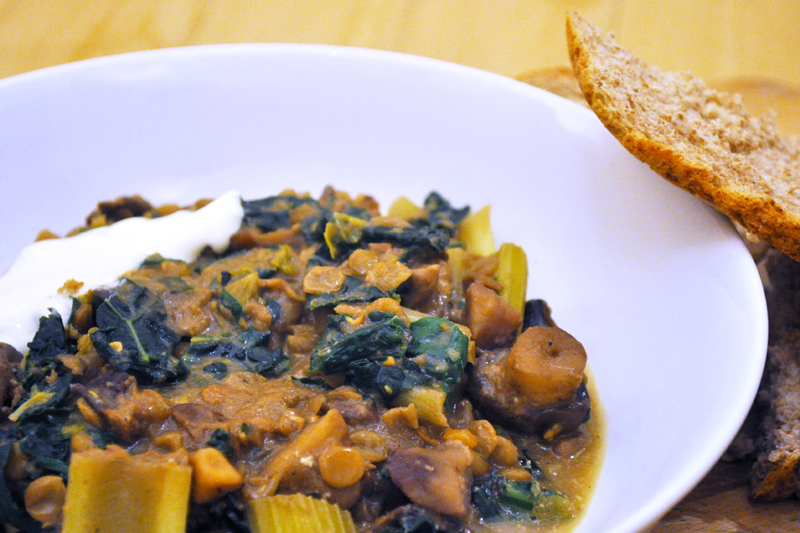 I wanted to do something slightly different this time, however, and found a lentils with mushrooms recipe in Rose Elliot’s Vegetarian Supercook from which this is adapted. I started by getting the Puy lentils onto the hob to cook. While they were simmering away I fried a chopped onion in olive oil in our big, quite deep, frying pan. After 5 minutes I added three cloves of garlic, the Portobello mushrooms (three per person) and a handful of quartered cherry tomatoes. Add the lentils when they’re cooked (about 25 minutes?) and a glass of red wine. Cover, lower the heat and let it cook for another 20 minutes. Lastly, thin two teaspoons of Dijon mustard with a little water and stir into the stew. Serve with mashed potato or, as we did, some steamed kale. The lentils would actually make a great base for a Shepherdess Pie.